Samsung's Galaxy Camera, the manufacturer's first entry into the world of dedicated shooters powered by Android, was announced with little warning at IFA earlier this year. 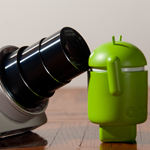 Besides Nikon's foray into the market, the Galaxy Camera is one of the only Android cameras we've yet seen. Frankly, of the two, Samsung's entry is the only one that seems worth looking at. The question of how much longer point-and-shoot cameras can see success is a fair one – after all, DSLRs are becoming smaller and more affordable all the time, while smartphone cameras are reaching to fill the gap point-and-shoots would leave behind. Right on schedule, Sony's PlayStation Mobile is going live today, bringing PlayStation titles to certified devices and – of course – PS Vita. While, at the moment, Sony's list of certified devices is limited primarily to Sony's own Android phones and tablets, more devices – including some from Fujitsu and Sharp – are expected to gain certification in the near future. HTC's One line is already on the list, with "details to be announced later on."